Today the Latin American Day 2013 took place at the University of St. Gallen, organized by Aiesec, and focused on the topic of Fair Trade. The founder of the company Eco Terra, Dr. Carmina Alvarado De Van Bergerem, and her husband gave a very lively presentation on quinoa, the special grain. 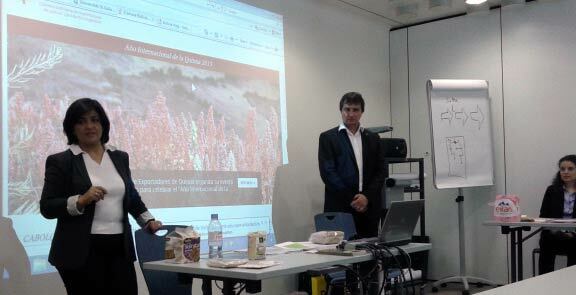 The started the company in 2006, importing Quinoa from Bolivia to Europe and also to the US. Quinoa is a unique cereal because it is gluten free and is very nutritious. The high quality quinoa grows above 4500 meters of altitude, a very challenging environment for humans, animals and plants. This is part of the reason why quinoa is both more nutritious, but also more expensive than other cereals. The UN has called 2013 the year of the Quinoa, emphasising the importance of this grain type to fight malnutrition in the world. You can use quinoa as cereal in the morning, to make soup or even to make quinoa-risotto, burgers or cereal bars. A great example of social business & looking forward to the webshop! The day concluded with a panel moderated by Prof. Eppler: among the panelist there was Francesco Illy, of Illy caffe and founder of Amici Caffè, Tobias Meier of Helvetas/Max Havelaar, Dr. Christiane Berth of the university, Heiko Specking of Credit Suisse and Nicolas Niklewicz of Impact Economy. You are currently browsing the Sabrina Bresciani blog archives for April, 2013.